With this project, we’re going to add simple coloring to create depth to flat objects by adding shadows. We take for granted the role shadows play. In another activity we’ll look into this topic further and showing how light plays a role in creating shadows. For today we’re just going to play with creating shadows. Shadows help our perspective, depth perception, and order. Without them everything would appear flat. Same with our individual psyches…without our shadow sides, we would be dull and flat. Our society tends to want to hide our shadows, our dark sides…that’s where we find out who we really are. And if we want to be healthy happy people, at some point in time we have to face our shadows and heal the wounds that lurk beneath the surface. Whoa! I went way off topic…sorry. Anyway back to the activity at hand. What I’m providing for you here is lacking in exactness and precision. 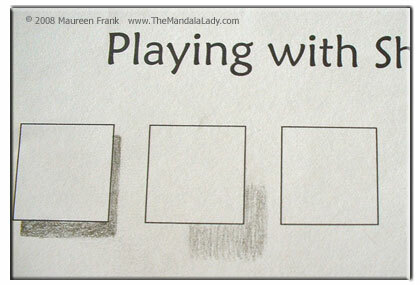 The purpose of this activity is to introduce you to the idea of shadows. If you want to explore this concept further and be more precise with it, plenty of books exist out there on the topic. The first row on the playsheet has 5 squares. Notice how flat and 2-dimensional they look without anything being done to them. 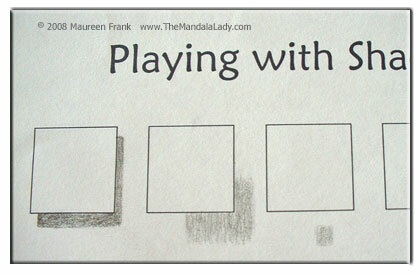 Step 1: Using your pencil, color in to the right of the first box as shown in this image. 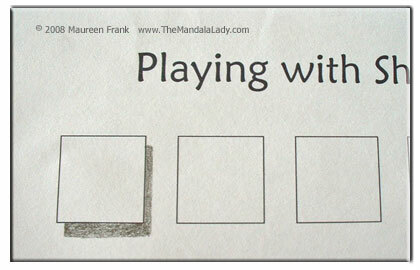 Step 2: Now color in below the box as I have done in this image. Notice how this makes that first square look like it’s above the paper. The square itself is still flat however now it has a more 3D look to it. Note that the shadow mimics the outer shape of the object that’s creating the shadow. With the first square we colored the shadow near to the edges and medium dark, making it look like the square is above but near to the paper. If you want to create the illusion that the square is further away, the shadow ‘box’ needs to be smaller and further away for the opposite edges. The shadow will also be of a lighter shade. In this image the 3D effect of the shadow for the second square is a little more challenging to see; mainly because of the closeness of the shadow on the first square and that the second square is level with the first square. If you cover the first square with your hand, the depth of the second shadow will be easier to see. See the activity on “Playing with Contrasts” to play with lights, darks and everything in between. ADDED ACTIVITY: Go about your home, office, room, etc. and look for shadows. Notice what makes some shadows darker and some lighter. In general the shadow will be darker and sharper when the light is very bright and the object is near where the shadow occurs. For the third square, I made the shadow even smaller and lighter than the first two and I put it away from the square. As I stated earlier, the shadows reflects the outer shape of the object that’s creating the shadow. So when working with circles, the shadow will have a round edge. With this first circle, notice how the shadow looks like a crescent moon…if you keep the in mind, it will be easier to color it in. Notice how I made it really dark. When you have a dark shadow, it usually means that light on the object must be really bright. I used the purple color pencil to color in this shadow. With the second circle, I put the shadow in a different location, with a lighter coloring of the purple. Here, too, you may need to cover the first circle to see the depth with the second circle. As I did with the third square, I made the shadow for the third circle be very light and away from the circle. On the third row of the playsheet are pairs of overlapping circles. 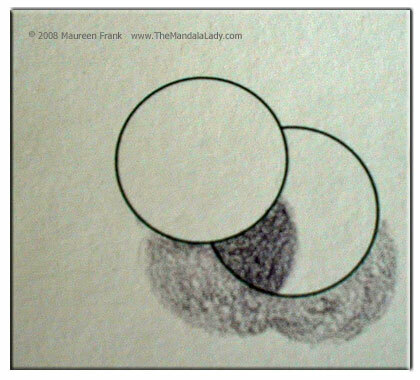 With the first pair, the first circle creates a shadow on the second circle and also on what’s beneath the second circle. I made the shadow on the second circle darker than the shadow reflections beneath the second circle. Remember that shadows mimic the outer edges of the object(s) that create the shadow. So here the shadow beneath the second circle is a combination of the two circles. The shadow is clueless that two objects are creating the shadow. Two shadows are created by the first (top) circle…one on the circle below it and then below the second circle. The two shadows will be shaped differently. ADDED ACTIVITY: Test this out for yourself. 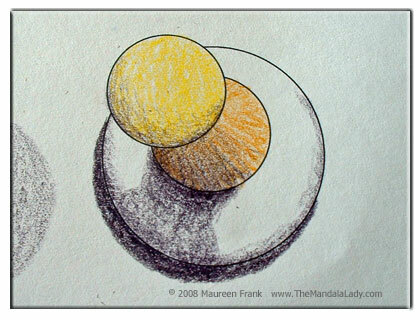 Take two plates and overlap them over a table where there is a light source above the plates. What happens to the shadows as you move the plates around. Now let’s play with color. 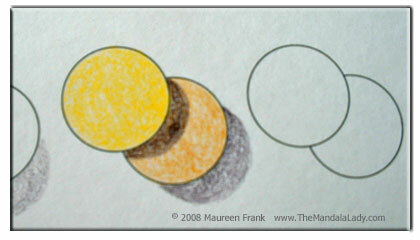 Color in the upper circle with the yellow (or the light of the two colors you chose to use). 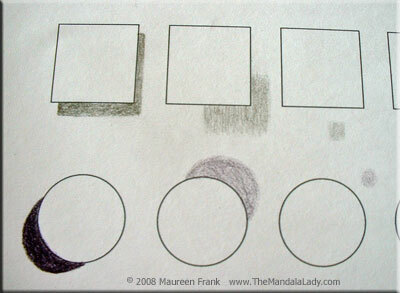 Color the goldenrod on the lower circle (or the other color you have). At this point these two circles look like they are glued together right on top of the paper. Now watch what happens when we add some shadows to it. 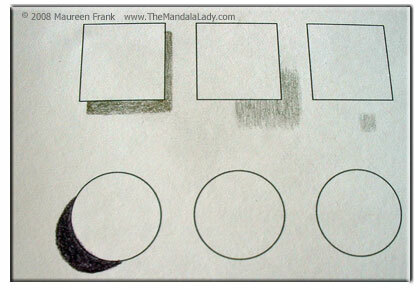 Use your purple pencil and color in some crescent-shaped shadows. In this case we’ll assume there’s one light source coming from one direction, so the shadows need to fall in line with each other (as best you can, of course). 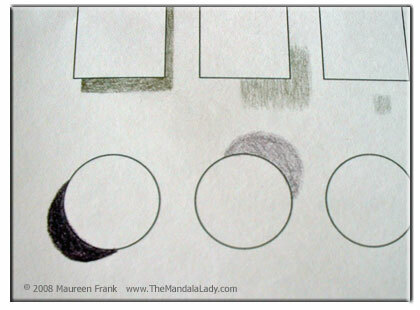 What happens when we color in the same shadow shape on to the circles themselves? In this case, make the circle shading a little be lighter than the shadow. Now the flat circles look more like small balls. When an object is three dimensional, that it too will have shadows on it. So along with creating a shadow, it will have a shadow on itself. We’ll play more with this idea in another posting. Last row…three overlapping circles. 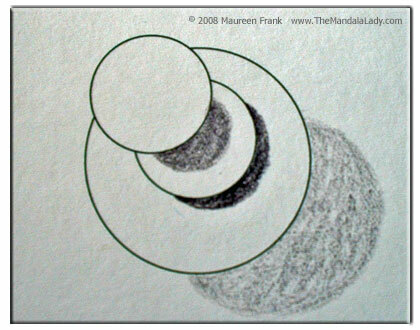 In this image, by adding shadows, it looks like three flat disks are floating above the paper. Putting all of what I showed you together into one example and using a little imagination I created something that looks like a joystick or a door knob, or whatever your imagination tells you. For me I imaged that the first circle was a knob (yellow color), th second circle (goldenrod color) was more of a tube (like a toilet paper cardboard tube) and the third circle was a curved cover (white, the bottom of the joystick). 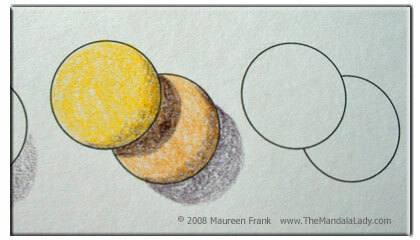 I then imaged what the combined shadow would be of the knob and tube and colored in the shadow on the third circle. The yellow knob needed a crescent-shaped shadow to make it look 3D. With the second circle (tube), the shadow on it would cover about half the circle rather than being crescent-shaped. The third circle has a bit of a curved shape, so I gave a narrow crescent-shaped shadow on it and a darker version of that shape below it. 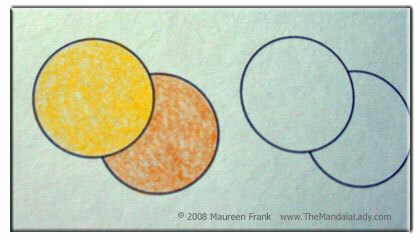 Play around with this and see what you can create out of these three circles. Sorry about that Sue…I fixed the problem…you should now be able to view the pictures and download the pages. Happy Coloring!